Nature and community rated most important. The public information session held on February 15th regarding the next stage of development in Wilden was well attended. 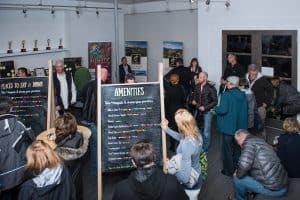 Over 170 people – both residents of Wilden and surrounding areas – showed up to help shape the vision of what will be the heart of the community: Wilden Village & Market Square. 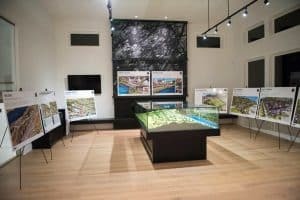 The Wilden team led visitors through an extensive presentation area, which displayed detailed plans and large renderings of the proposed development. Everyone was asked to fill out a feedback form indicating which of the plan features they considered most important. A majority of people named “parks and pathways” to be their top priority, followed by “nature preservation” with a special emphasis on wetlands, wildlife habitat and trails. The commercial area was voted the third most important feature, and the school and housing variety came in fourth and fifth. Residents were also asked for their opinion on the type of amenities they would like to see in the Village & Market Square. 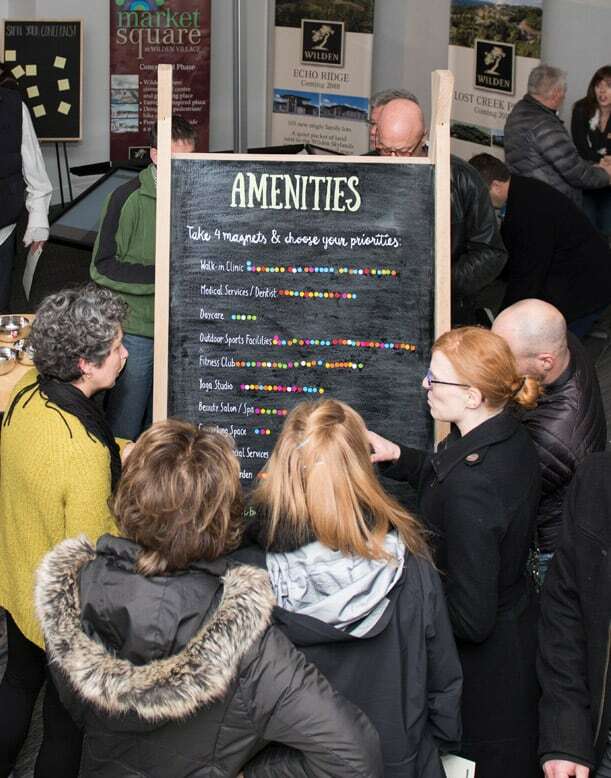 Interactive voting boards covered everything from places to eat, shop and play to the size and style of homes. Coffee shop, bar & grill, craft brewery, grocery store, bakery and walk-in clinic ranked highest on the list of most-desired places in the Market Square. When asked for their priority in home style most visitors voted for small townhomes. The only concerns raised, aside from nature preservation, was that the development could increase vehicle traffic and parking issues within the community. While developing an area will bring increased volume, roads in Wilden are designed to accommodate the growth. In fact, the creation of a compact urban village that integrates parks, natural ponds and a vibrant commercial hub will actually foster a walkable lifestyle, decrease the need for cars and contribute to the sense of community. Furthermore, the entire Market Square will have underground parking, which lowers the development footprint and frees up space for visually appealing open spaces and pedestrian-only areas. The vision of Wilden Village & Market Square has been in the Wilden master plan since day one. “Now that the time has come to move forward with this phase of development, we purposefully shared our vision with residents to get their input and are pleased with the results,” says Cameron Dodd, Development Manager for Wilden. “The feedback we received confirms that our plans are very much in line with what residents envision for their community,” says Dodd, adding that 80% of people who submitted a feedback form are in support of the proposed development. Renderings of the Wilden Village & Market Square can be viewed HERE.